For the first time this year my heating has been on, and with good reason, as this week it is expected to plummet to as low as -3C in northern rural parts of the country. Up to 2 inches of snow is also forecast in Northern England and Scotland. The polar winds are causing this frosty weather, pushing daytime temperatures down to a measly 9C (48F) in the north and 11C (52F) in the south. Scotland should expect some snow fall to really boast winters arrival. Even worse, in London, the wind chill factor will make it feel as if it is -5C (23F) so make sure if you’re out and about wrap up warm! At the weekend a village in Oxfordshire recorded temperatures of -3.5C (38F), supporting the fact a cold front is on its way. Last years big freeze was the coldest for 30 years, which saw December, January and February’s average temperature at a bitterly cold 1.5C (35F) and this year is expected to be no different. Lets try and keep to Energy Saving Weeks tip 3 though. 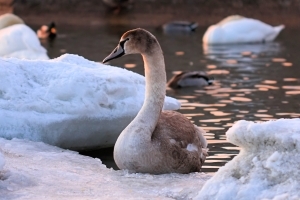 It’s not just the weatherman who is predicting this icy weather, it seems that the Siberian Swans agree as they have flown 2,500 miles to escape the harsh Russian winter and come to the slightly warmer UK. However, folklore says that when the birds land here it means we are in for a long, brutal winter. I am really hoping these birds don’t bring that much bad weather with them! The first of the birds arrived in Wildfowl and Wetlands Trust nature reserve in Slimbridge, Gloustershire, on the 19th October and are expected to have about 300 more of them make the treacherous journey across the world. Rather them than me. Good news though, a Met Office official believes this Artic blast will not last. Fingers crossed! Anglian Home Improvements raising the standards of our homes since 1966. Visit our homepage for more information on our products.